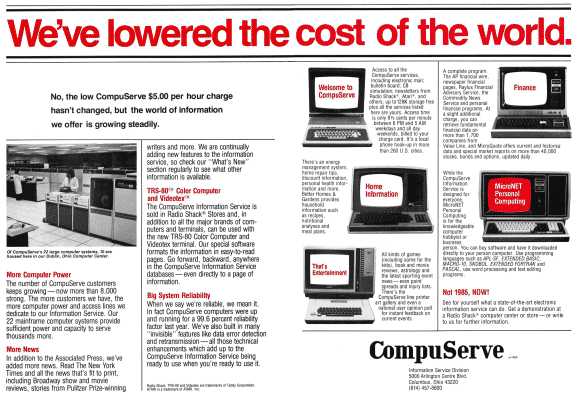 CompuServe launches the first consumer-oriented online information service, which they called MicroNET. This marked the first time a consumer had access to services such as e-mail. 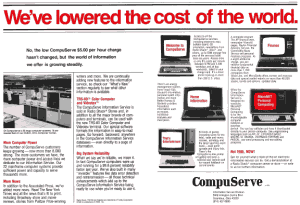 The service was not favored internally within the business-oriented CompuServe, but as the service became a hit, they renamed the service CompuServe Information Service, or CIS. By the mid-1980’s CompuServe was the largest consumer information service in the world and half their revenue came from CIS. In 1989 CompuServe connected its proprietary e-mail system to the Internet e-mail system, making it one of the first commercial Internet services. However, CompuServe did not compete well with America On-Line or independent Internet Service Providers in the 1990’s and lost its dominant market position.